There are, literally, hundreds of thousands of promotional products and thousands of different uses for promotional products. But they all have one thing in common! They’re memorable! As detailed on our promotional products research page, 75% of recipients who received promotional items could remember the advertiser. And over 70% of recipients kept their promotional item because it was useful. 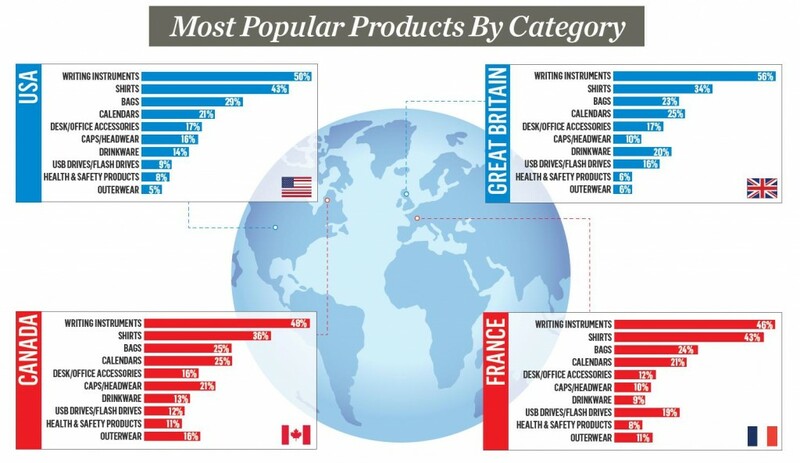 Below is a graph showing the most popular promotional products by category – as reported in a major research survey on promotional products usage. Survey respondents were asked to provide up to three promotional items they had received in the last 12 months. Promotional items were defined as items that include pens, T-shirts, mugs, calendars, or any items that have a logo or message from an advertiser on them; they are usually given away for free to consumers in hopes of positively influencing their purchasing preferences or their attitudes toward the advertiser. As the chart below reveals, Pens & Writing Instruments were the items most commonly cited, as nearly one-half (49%) of promotional product recipients reported getting at least one in the last 12 months. There are also significant differences by country, as revealed on the chart. Here is a listing of various promotional items and promotional product categories available from Flat World Design in our online catalog. We hope you will find this “sitemap” information useful.